Since 1987 we have had the pleasure of building an entrusted customer base throughout Texas as well as the surrounding states. We specialize in residential, commercial and government roof replacement; and provide the following services: siding, gutter installation, waterproofing, elastomeric coating, and window installation. With over 25 years of experience and highly seasoned staff, we believe in performing first-class work and are confident that we can provide you with the exact solution you are looking for. 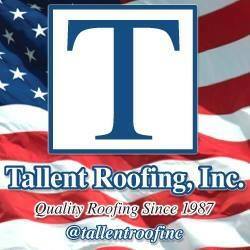 You can Trust the Talented Team at Tallent Roofing, Inc.!